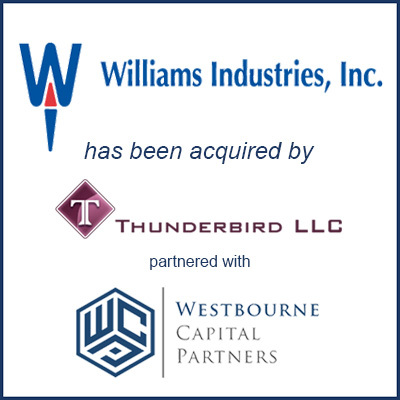 Shelbyville, IN – December 2017 – Westbourne Capital Partners, in partnership with Thunderbird LLC, has acquired the assets of Williams Industries. Williams Industries, based in Shelbyville, IN, is a manufacturer and marketer of branded injection molded drinkware and other plastic products for the retail, fundraising and advertising specialty markets. The Company has extensive in-house plastic injection molding and print-on plastic capabilities. Going forward, Williams will operate as a subsidiary of Thunderbird. Westbourne Capital Partners works closely with family offices and high net worth individuals to deploy capital and invest in private companies, primarily through change of control transactions. Thunderbird LLC invests in American companies that manufacture domestically for global markets. Targeted industries include automotive, military, semiconductor, power, firearms, and others. Representative investments include Metal Impact LLC and F&B MFG LLC. Molding Business Services acted as the exclusive financial advisor to Williams Industries. Click here for Plastics News write up on this transaction.